Sugar Palm buds grow off the large, thick flower stalks of the Sugar Palm tree. Flower stalks are long and pendulous, growing to up to 2 meters in length. From the main stalk are many separate flower branches that grow to around 1.5 meters in length. On the flower branches are the numberous olive green buds, each 1 centimeter in diameter and 2 centimeters in length. The stalk and flowers themselves are not eaten -- rather, the stalk is tapped for its milky white sap which has a mild, semi-tart flavor with undertones of coconut water when it is fresh. 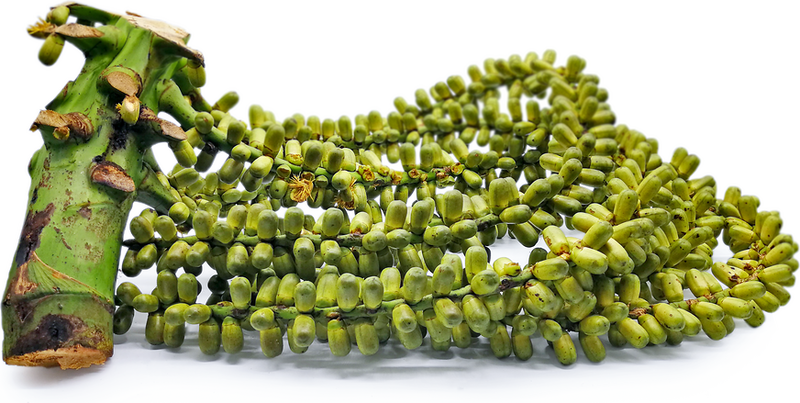 Sugar Palm buds are available year-round. Sugar Palm refers to several species of palm trees. In Indonesia it generally refers to Arenga pinnata. Sugar Palm flower stalks are valued for their sap, tapped from the tree. The tapper must ascend the tree by ladder or help of a rope. For weeks before tapping, he must swing and beat the flower stalk, so as to encourage the sap to flow. The tapper must then ascend the tree to cut off the entire stalk and bud formation close to the trunk of the tree. A bamboo or plastic container is tied to the stump where the sap flows to collect it. Up to 6 liters might be collected per day from a single tree. The sap from Sugar Palm contains calcium, potassium, starch and natural yeasts. The sugar produced from the Sugar Palm is rich in vitamins and minerals, and is a low-glycemic alternative to other sweeteners. Sugar Palm sap is used to produce palm syrup and palm sugar, also known as jaggery, gula aren and gula kawang. These products are used in drinks and desserts. The sap is also commonly used to produce vinegar and fermented palm wine. To make palm wine, coconut fibers, which add a pleasant taste to the liquid, are added to the sap. This is left to ferment for several hours. The resulting liquid is called "tuak" in Indonesia, and has the alcoholic content of beer. It is usually drunk within a day, or else it turns into vinegar. Tuak may be distilled into a more refined, vodka-like liquor called "arrack", drunk neat, or used in cocktails. Arrack should be used within a month. The brief lifespan of these liquids mean that palm wine, vinegar and arrack are rarely exported, and will be drunk or used close to the source of production. All liquid products should be stored in the refrigerator. The Sugar Palm is a highly important plant in Indonesia. The Sundanese in Java believe that the plant originated from the tomb of a goddess. There, Sugar Palm root is used in local medicine to help cure back pain and eye problems like cataracts. Traditional methods of tapping Sugar Palm trees is still carried out by people in rural areas in Indonesia in places like Bali. Traditionally, each tree "belongs" to and is said to respond to just one tapper. In the past, before tapping, the tapper would perform incantations and chants. Today, he might sing to the tree as he taps. Tapping is carried out twice a day - in the early morning between 5am and 6am, and in the afternoons between 4pm and 5pm. Sugar Palms occur in tropical Asia, particularly in China and Indonesia. Their exact origins are unknown.